October has me in a polka mood. Found this LP on a dig in Colorado last spring. Standard issue vanity pressing with no year noted, and no markings whatsoever (but pressed on groovy blue vinyl!). I really didn't need yet another Colorado polka record, but then I flipped over the album, and saw this pasted picture. I totally want to hang out with these people. 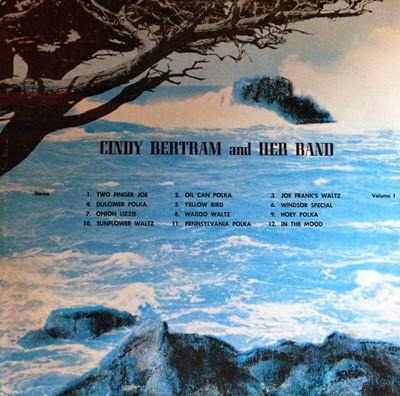 Back of the album is autographed by Cindy (on accordion), keyboardist Rachel Bertram, Tom Schell on trumpet, and on dulcimer, Paul C. Strickline. Typical polka numbers here, but I got a kick out of the accordion version of this Glenn Miller standard. Listen to a sample of "In the Mood"
Quick Internet search finds that Cindy attended Adams City High, in Commerce City (the same school that hatched the surf-rockers, The Shelltones), and graduated in 1971 (NOTE: Commerce City was home to the prolific Infal label). 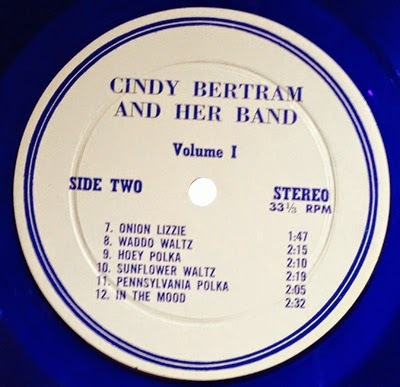 In 1968 Cindy and her band released an EP on the Band Box label (Band Box 386: “Forever and Ever”/"Shpitzkoph” and “Somewhere My Love”/“Gary’s Polka"). Label on the disc shows "Record #2." The album above indicates "Volume 1." 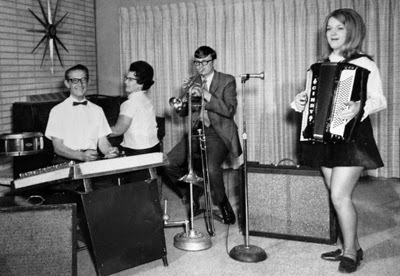 Newspaper archive searches show that Cindy and her band were active through 1974, performing at the Blue Willows Lounge (formerly the Dutchman Inn), in Greeley. Digging around the Internet shows that Rachel passed away in 2005. Can't find any other information on the other band members. Sent a few e-mails to some Cindy Bertrams I located online. Alas, none were she.